Law enforcement sources confirmed to a local ABC13 affiliate, that at least eight people were shot and killed. A suspect is in custody. It’s not clear how many people were injured. Students at the school are being transported to the Alamo Gym located at 13306 Highway 6, according to the ABC affiliate report. An armed suspect, who authorities think is a student, walked into the art class at Santa Fe High School and began firing what looked like a shotgun, a witness told ABC. Santa Fe Police, the Galveston County Sheriff’s Office, the ATF, as well as FBI agents responded to the situation. Video footage showed students lined up outside the school. 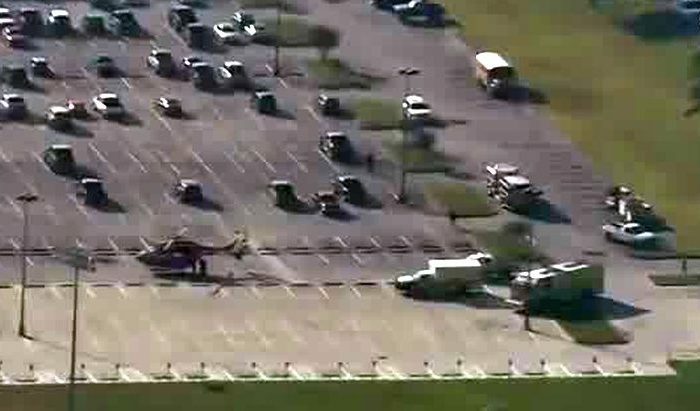 The Harris County Sheriff’s Office wrote in a tweet that they are assisting with what they described as a “multiple-casualty incident” at the high school. President Donald Trump issued a statement on the matter on Friday morning, May 18. “School shooting in Texas. Early reports not looking good. God bless all!” he tweeted. Angelica Martinez, 14, who goes to the school, said that she and her classmates thought they were being evacuated for a fire drill. “We were all standing (outside), but not even five minutes later, we started hearing gunshots,” she said. “And then everybody starts running, but like the teachers are telling us to stay put, but we’re all just running away. I didn’t see anybody shooting, but like (the gunshots) were kind of spaced,” Angelica said, adding she heard around four shots in all. “I didn’t look. I just ran,” she said, saying that she didn’t see the suspect.